In this adventure, the characters are crew members or passengers on a starship. As they emerge from jump in the remote system of Parvati and begin moving towards the mainworld, they pick up a distress signal, a Reticulan (grey alien!) 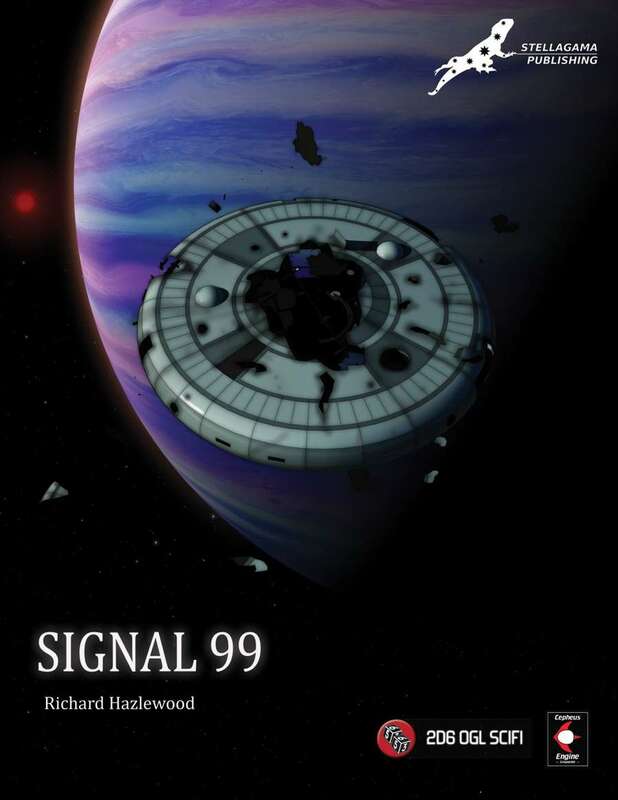 “Signal 99”, from a nearby ship. The ship is in danger and in need of rescue. The damaged ship is a dreaded Reticulan Abductor. The hated Reticulan Empire used these large vessels to capture subjects for their nefarious experiments. As the characters explore the ship, they will discover that there are many human subjects aboard the ship in low berths – what the Reticulans planned to do with them is the subject of horror stories. This should be especially disturbing to the characters, as the Reticulan Empire recently signed a treaty with the human United Terran Republic that specifically outlaws abduction and experimentation on humans. There are a number of Reticulan survivors as well. Also aboard the Abductor are a group of insect-like Zhuzzh, known throughout the galaxy as hard-nosed scavengers and pirates. The characters will discover the Zhuzzh as they are removing the frozen humans from the Abductor and transferring them aboard their ship. Their ultimate purpose is unknown, but the Zhuzzh do not want to share their “salvage” with others. The characters will have to make some tough decisions. Will they try to save the surviving Reticulans, including children, or let them die and save just the humans? Will they go after the Zhuzzh vessel when the salvagers flee or stay and save more survivors from the ship? There are no ideal answers to these dilemmas. Driving this tension and action is the impending explosion of the Abductor’s damaged power plant. No matter what they do, the characters will not be able to save everyone – they will have to save as many as they can and then flee for their lives. This adventure is designed for a group of four characters. It assumes that the characters have their own ship, however characters who are just passengers aboard another vessel will probably get involved, as all ships that hear the distress call are legally bound to render what aid they can. Ideally, even the most grizzled veteran will want to save innocents from dying in the vacuum of space. Although this adventure is designed to be run in the These Stars Are Ours! setting, the Referee can adapt it to any setting with only a little work. Compatible with the Cepheus Engine and other OGL 2d6 Sci-Fi games. "A trail of blood leads from stateroom 3D" (to stateroom 3E, see p. 25), OK, but if I'm not mistaken "The atmosphere is gone" and "The entire ship is under zero-gravity" since the disaster, I doubt injured people in (holed?) vacc suit leave a 'regular' trail of blood under these conditions, or am I missing something? Just curious, what's the color/appearance of Reticulan blood? Reticulans have red blood; they're close enough to humans to have hemoglobin. Regarding the blood trail physics in vacuum and zero-G, I'm checking this; I will get back to you soon.